A client of Baghunter, the industry leading marketplace for collectable luxury handbags, broke with tradition by proposing to his girlfriend with a rare and unique Hermes Birkin Bag instead of a diamond ring! The value of diamonds has dramatically fallen in recent times. This shift in the perceived value of diamonds has led to young men seeking new and unconventional gifts with which to propose, such as a bespoke Hermes Birkin bag. A new trend may be on the horizon as a customer of luxury handbag site, Baghunter, utilized the company’s Bag Bespoke service to customize a rare Hermes Birkin bag and use it to propose to his girlfriend. 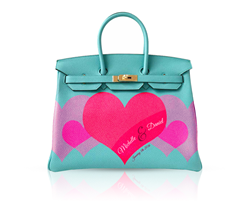 The gentleman requested a custom artwork on the Birkin to include the names of both himself and his girlfriend and the date of the proposal enclosed in a red heart, doing away with the tradition of using a diamond ring. The idea of proposing with unconventional gifts isn’t completely unheard of among young affluent men, as diamonds begin to lose their sparkle both in terms of uniqueness and value. Recent figures from the Wall Street Journal show diamonds have collapsed by as much as 80% in real terms over the last 30 years, while a recent study by Baghunter, which made headlines in Time Magazine among others, showed a Birkin to be a safer investment than the S&P 500 and gold over a similar time period. Taking all of this data into account, it is highly likely more and more people will shun diamond rings as a method of proposal and instead turn to other ultra-luxury items which provide both beauty and financial safety as an heirloom, such as Birkin bags, which have historically been a solid investment opportunity over the last 30 years as opposed to diamonds, which can be shaky at best. Baghunter is an A+ rated BBB accredited business which buys, sells, and consigns ultra-luxury handbags and purses including brands such as Hermes and Chanel. Baghunter also offers an authentication service for every bag sold through the website, a Bag Bespoke service for customization of bags with Swarovski crystals or bespoke artwork, a Bag Concierge service to help clients find rare and unique handbags, and a VIP Club which offers benefits to avid purse collectors.